I haven't been able to find a good way to approximate the amount of caffeine in the coffee I make. 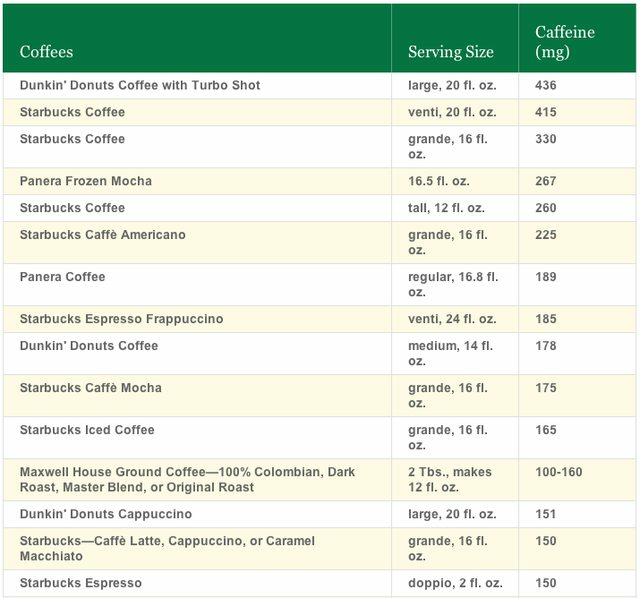 Googling yields information like this Mayo Clinic article that mixes serving sizes and brewing methods, and it reports one 8 oz coffee contains "95-200 mg" of caffeine, which is a huge range. If I have three cups of coffee in a day, is that 300 or 600 mg of caffeine? There are so many variables in prepared coffee, different extraction methods, beans, roasts, serving sizes, mixed with different amounts of water or milk. Is there a general method for calculating the caffeine in prepared coffee? Something like "most brewing methods extract X mg of caffeine from each Y grams of ground coffee"? Or more specifically, what method would I use to accurately estimate how much caffeine is in an 8oz serving from my 10 oz french press, made with medium- (not course-) ground medium-roast arabica beans, brewed 4 minutes before decanting? I read everyone's answer and did some of my own research to find an estimation method that satisfies me and might be helpful to others too. I think it should be roughly ±20% accurate. For any amount of "good strength" American-style coffee by any brew method, weigh the dry coffee in grams and multiply by 0.008, or 80mg of caffeine for each 10g of dry coffee. Weakly extracted coffee might yield 0.6% of its weight in caffeine and very strongly extracted coffee might get close to 1% caffeine. These numbers are for typical 100% Arabica or mostly Arabica blends. 100% Robusta beans (uncommon) could be about double the caffeine. Typical premium roasted Arabica coffee beans like mine contain close to 1% caffeine by mass when measured by spectrophotometer (p 311) though Robusta (less common and usually blended with Arabica in cheaper coffees) has roughly twice that much. If you have a health concern like wanting to stay under the 300 mg guideline for pregnant women, you should be able to use this as the upper limit: each 10g of Arabica coffee contains about 100mg of caffeine. I use a 2 Tbsp scoop to measure beans before I grind them. One scoop of beans weighs about 12 grams (yes I tared the scoop, but I did only weigh once and am not comparing light or dark roasts which will vary in weight and volume). So if I eat that scoop of beans or grind them finely and drink them with any amount of water I will be consuming the 120 mg (1% of 12g) of caffeine present in them. That should be an upper limit to this estimation exercise. The strongest or biggest/weakest cup of coffee I can brew with that scoop of beans will have no more than 120mg caffeine. How strong is my cup? So 1 fl oz of brewed coffee or espresso weighs almost the same as water (29.57 g) and contains 1-2% coffee solids (so about 300-600mg, or 380mg solids for optimal brewed coffee and 600mg solids for espresso). That would be the upper limit if the coffee solids were pure caffeine, but they can't be. On the other hand,the caffeine is probably more soluble than the other parts of the bean,so even though it's only 1% of the mass of the beans it's probably more than 1% of the dissolved solids. That's the hard part. Coffeechemistry.com says brewed coffee ends up with 8-15 mg caffeine per oz and espresso 30-50 mg caffeine per oz. That's a pretty huge range. It means caffeine is 2.5-4.0% of the solids (380 mg) in an ounce of "optimal" brewed coffee or 5.0-8.3% of the solids (600 mg) in an ounce of espresso. So: I typically make a nice strong 10 oz cup of coffee with my 12g of beans containing a maximum of 120mg (or 1% of the coffee mass) caffeine. So let's say this maximum 12 mg caffeine per each oz of coffee corresponds to 1.65% or 500 mg solids (1.65% of 29.57 gr = 500 mg). In this case the 12 mg caffeine is 2.4% of the solids. If I brew it "too weak" and it ends up 1% solids (or 300 mg per oz) I would guess I'd proportionally get no more than 60% of the max caffeine, 7.2 mg (again 2.4% of the solids) per oz or 72 mg for a 10oz cup. So that narrows the range to 72-120 mg of caffeine in my cup depending on the brew strength. I'm guessing a good cup ends up somewhere in the middle, so I'm going to estimate my typical cup contains around 100 mg of caffeine from its 12g dry coffee, or about 80% of the maximum caffeine present in the beans. 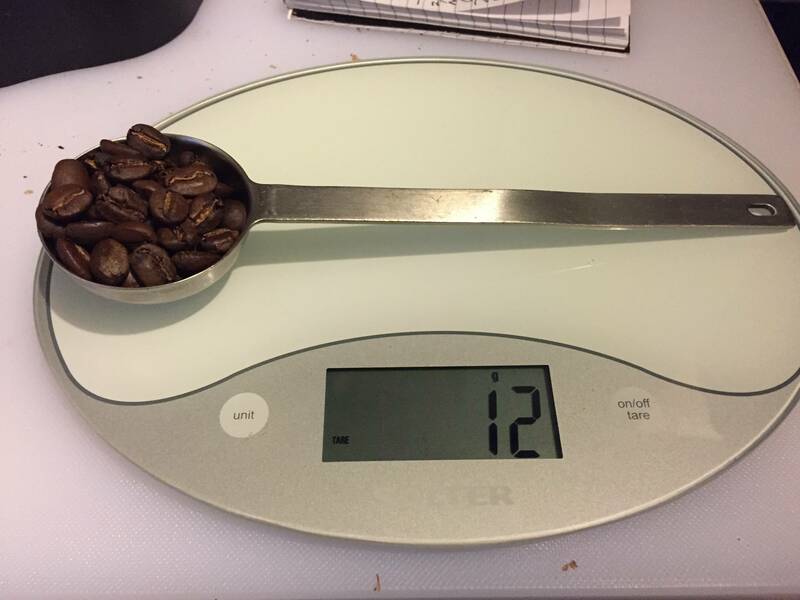 From this I would suggest a decent rule of thumb for "optimal" strength American-style brewed coffee is around 0.8% (or 0.008) of the mass of the beans used, or 80mg of caffeine for each 10g of dry coffee. Using the same method, a shot of espresso made with 7g of ground coffee maxes out around 70mg caffeine (77mg if 10% Robusta sometimes typical for Espresso blends), but the serving size and strength are more standardized than brewed coffee, so the 64mg/shot reported by the USDA and others also ends up being 80-90% of the caffeine present in the beans. Estimation is all well and good, but if you really want to know exactly how much caffeine is in your cup, you're going to have to measure it! You can get caffeine testing strips that you can dip into coffee, and they'll give you an idea of how much caffeine is in the brew. 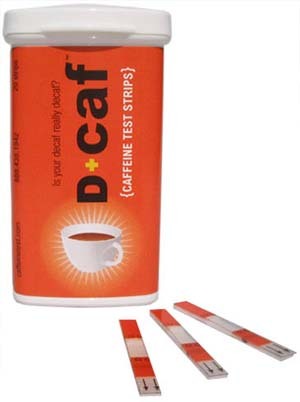 The strips have a couple of lines on them, marked D and C. Decaffeinated beverages will only rise to the D line, caffeinated beverages will rise above it. You do have a problem that you're going to have to bust out some science to calibrate this thing yourself - out of the box it will not actually measure the amount of caffeine in a drink, but if you try it on some drinks with known amounts of caffeine you should be able to work out a system of measurement. Get yourself a Mass Spectrometer. There will be caffeine intake of other drinks as well. Sourced from Google which pulls its data from this USDA link - Basic Report: 14221, Beverages, OCEAN SPRAY, Diet Cranberry Juice. Tinker around and you'll find the other types. The values are for 100 grams. This is best because g can be directly derived from an SI unit. Measure the amount of pulp. If your grounds are already wet, you have coffee pulp. Figure out how much you have by weighing it on a scale; it will help if you keep the pulp in the filter so that it does not spread and create a mess. Convert the pulp into dry measurements. Do this by subtracting the amount of water you added. You can find this amount by calculating exactly how much coffee you initially put into the coffee maker, minus the amount of coffee that was produced. This amount will be very small, but it will affect the mass of the final pulp. Measure out an equivalent amount of water (which is usually measured by volume rather than weight) and weight it on your scale, being sure to subtract the weight of the container from your final measurement. Subtract the weight of the water from the weight of the pulp. Multiply the dry measurement by the amount of caffeine in that type of coffee. If you made instant coffee and have 2 grams of dry instant, for instance, you will multiply this into 3,142 and divide by 100 for a final answer of 62.84 milligrams of caffeine in the coffee pulp. It really varies by size, bean origin, roast method and other factors. To be honest, with all of the variability in coffee, if you want completely accurate numbers, you'd have to prepare multiple samples of your coffee brewed the same exact way (preferable 3 or 4 samples to be sure of consistency), and send this off to an analytical chemistry lab, where they will use a Mass Spec instrument (maybe GC-MS) to determine content. The reason you don't see more cafes displaying numbers for their caffeine content is because this testing can get expensive. Your specific example of brewing with a french press will also have trouble being determined because we don't know your grind size (exposed surface area), and we don't know your dose. Caffeine yield is directly related to dose. Also that Mayo Clinic study is very, very, poorly cited because it just gives names of journals and years, not specific studies, issues, or authors. I based on there being no direct trace to it's source, like just listing multiple sources that are properly cited, I would say that that article is not a reliable source of information. This should help you arrive at a more accurate number. standard drip brew yeilds an average of 145mg of caffeine per 8 fl. oz. french press yeilds an average of 107.5mg of caffeine per 8 fl. oz. The difference is a 58 to 43 ratio. Now, assuming most of the coffee brands listed on their caffeine database are brewed using the standard drip method, you could calculate the average french press ammount of caffeine per brand of coffee by taking the 58/43 ratio of depreciation into consideration. 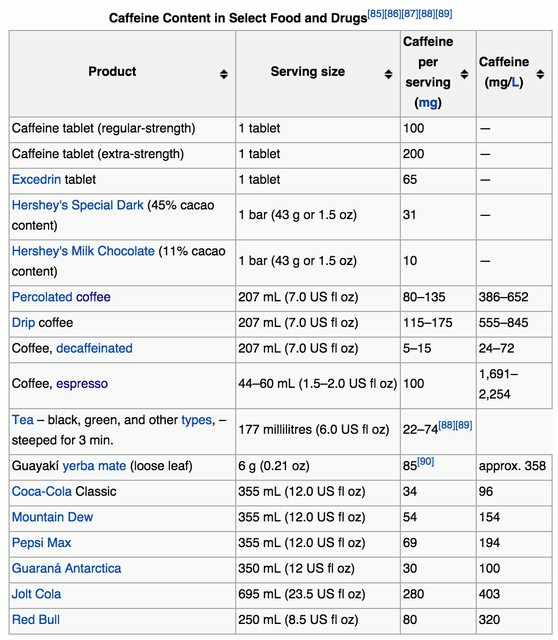 According to here, there is 180mg of caffeine in an 8 oz. cup of Starbucks brewed coffee. of caffeine in an 8 oz. cup of french press regular Starbucks coffee brewed at home. Not the answer you're looking for? Browse other questions tagged brewing-process caffeine or ask your own question. What is the optimal brewing technique for extracting caffeine? Instant coffee has less caffeine than percolated and filter drip? Why does some coffee “hit me” harder than other coffee? How much French Press is a serving? Can coffee pods be brewed in cup? Recommended time to finish a cup of coffee for the best caffeine surge?